The international break was a good one for Valencia, with Parejo finally realising his dream of playing for the Spain national side and Rodrigo staking an even better claim to play in the world cup, scoring Spain's only goal against Germany. The team usually does well after such breaks and continued that run today, scoring a hard fought win over their favourite whipping boys (played six, won six) Leganes in a scrappy game. Leganes have gained a reputation this season for being a tough side to break down and this was clear to see today. They played 5-4-1, defending solidly and denying Valencia space. For our part, our defence was also really well-drilled and organised. It was our attack that was a bit of a letdown. We never got going and it wasn't helped by Leganes committing a number of niggling fouls as soon as we crossed the halfway line. In the 8th minute Zaza put us ahead. Rodrigo cut back nicely to Soler and his centre provided the Italian with a tap-in. In real time it did look offside, but the freeze frame on the replay showed that Soler had timed his run perfectly. Unfortunately, the linesman put his flag up. A shame for many reasons, a goal would have opened up the game nicely. As it was, the game after that was mostly a turgid affair. Lots of fouls from Leganes to break up the play, with Valencia eventually doing the same when it became clear that the referee wasn't going to produce any cards. Both goalkeepers could have brought a chair along as neither had much to do. Jaume was forced into his first save in the 30th minute and a few Valencia attacks broke down. Half-time, little to write about. Next 15 minutes.... the same. 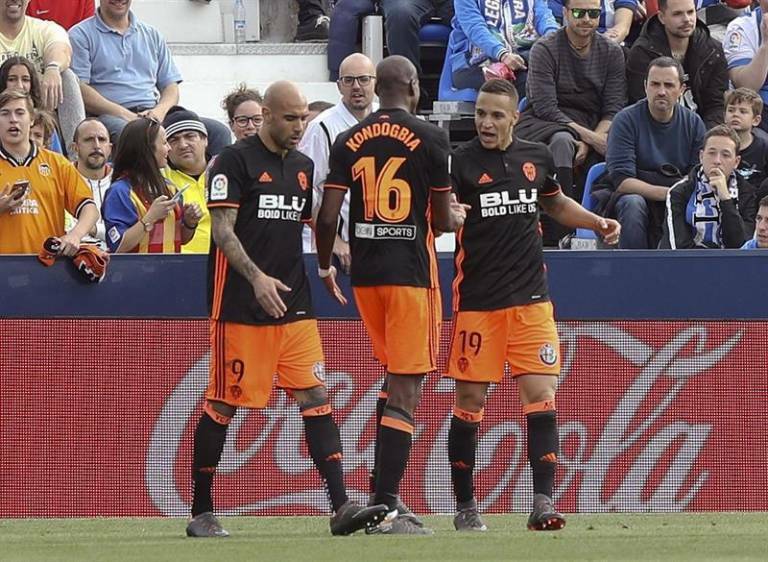 A 0-0 draw looked a strong possibility until Valencia finally broke the deadlock in the 62nd minute. The Leganes player took too long on the ball, always a mistake when the machine Kondogbia is nearby. He stole the ball, Parejo toed it to Rodrigo and he took a touch outside the area and beat Cuellar with a low shot inside the near post. Valencia had just about edged the game and Leganes had looked toothless in attack, so it was probably fair. There were only two real incidents after that. Jaume hadn't looked secure in the air the whole game, punching a few balls he should have caught when under no real pressure. He fluffed a cross and Leganes should have scored from a pull back, but Gaya blocked superbly. Late on, Leganes had a penalty shout when Pereira may have handled. It would have been harsh and the referee waved it away. A dull game overall. Valencia do well against free flowing teams (like Betis) where we have space to counter-attack but we still have work to do on breaking down scrappy ten-men-behind-the-ball teams like this, where we often look uninspired. I'd have tried a few more shots from our midfielders, several of whom have an evil shot on them. Nevertheless, credit to the team which has 22 points from the last 24 and got a very important three points which takes us even closer to mathematically certain Champions league qualification, especially with both Sevilla and Villarreal dropping points to give us a monster 15-point lead. Overtaking the Madrid teams remains doable and the 77-point record as well: the team has the same number of points that Nuno had in 2014-15 and only one fewer than Benitez had in 2004 at the same stage. Rodrigo 7.5 - was closed out for most of the game but made the difference when he had to. Having an excellent season.